with the rare elements of grace, beauty, spirit, and fire. With their thundering hooves and flowing manes, horses are one of God's most majestic creatures. In this gorgeous four-color gift book, the stunning artwork of Chris Cummings is the perfect background for lovely quotes, heartwarming poetry, and classic literary snippets that highlight just why we love these four-legged wonders of speed, grace, and beauty. Domestic or wild, big or small, solid or spotted, man has been fascinated with the horse from almost the beginning of time. Not only an iconic symbol of the West, the horse represents what it means to work endlessly, stand tall through adversity, and love unconditionally. Perfect for accomplished equestrians, everyday horse lovers, and any grown-up who ever wanted a pony as a kid. Chris Cummings paints the horses and rural scenes that she loves so much. 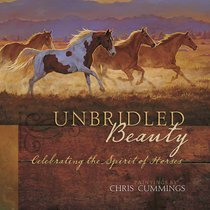 Her popular, vibrant art is showcased in the book Unbridled Beauty and is enjoyed by fans on many licensed products. Her original oil paintings hang in private collections throughout the country, and she is always creating new work.